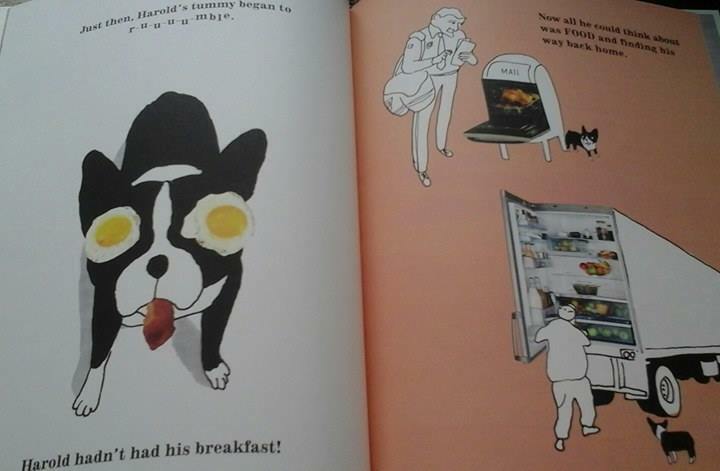 ‘Harold’s Hungry Eyes’ is a stunning picture book from Kevin Waldron featuring a food-obsessed Boston Terrier called Harold. 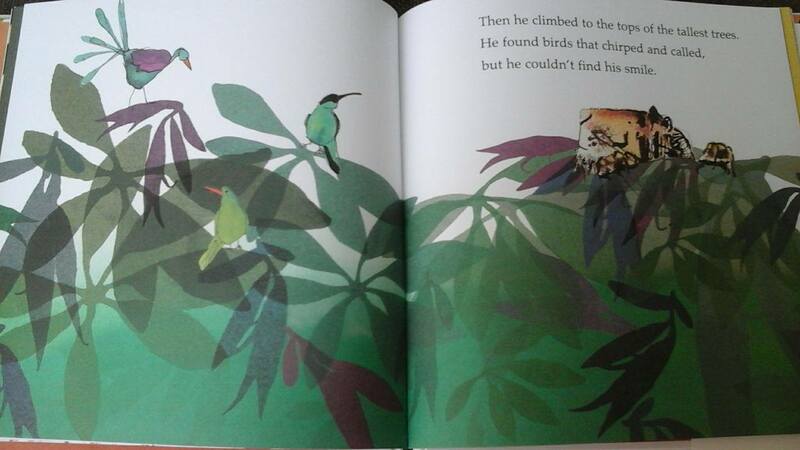 Children will be totally enchanted by Harold, my girls leapt on this book as soon as it appeared at home and it has already become a family favourite. Who could resist this adorable face? One morning, Harold wakes to find his favourite chair is missing. 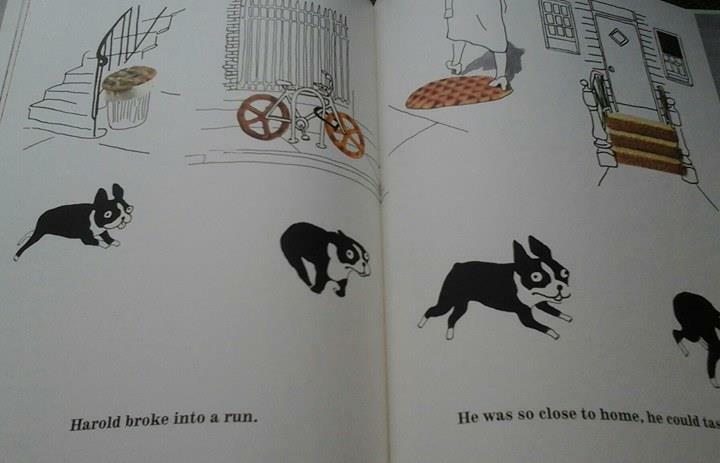 When he discovers it being taken away by a dustbin lorry Harold sneaks out to follow. 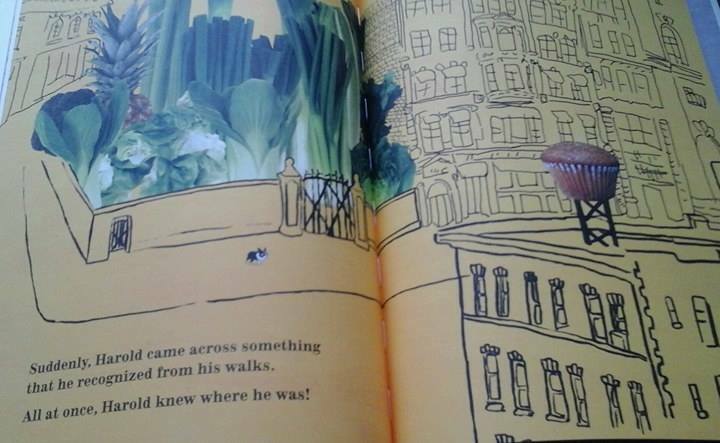 Soon he is lost in the big city and when Harold’s tummy begins to rumble he realises he hasn’t had breakfast. And everywhere he looks all he can see is food, food and more food………. He then realises his imagination and big appetite will help him find his way home. Along the way he sees food in the most unlikely places – on buildings, cars, in letterboxes and on buses, from a waffle manhole cover to wafer biscuit steps. All of them are leading him home! This delightful story will really capture children’s imaginations and they will laugh out loud at the mischief Harold finds himself caught up in on his never ending quest to satisfy his appetite. 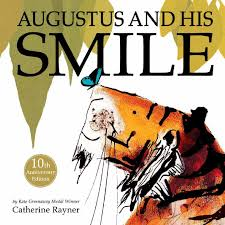 The black and white line illustrations contrast sharply with the strong block colours and collages used throughout, we are quite clear who is the star of this book. It’s all about Harold and quite right too! The production is sublime and filled with gorgeous details. 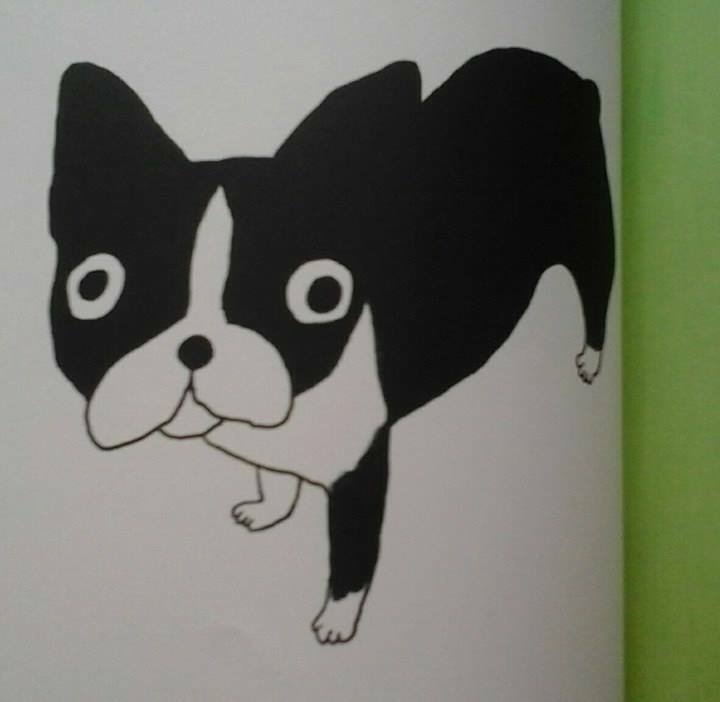 I particularly love the Boston Terriers hiding underneath the cover, the variety of expressions on Harold’s face is especially endearing. 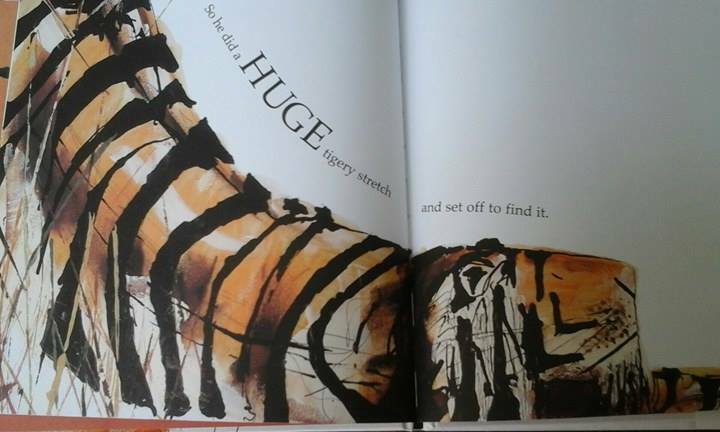 It would be brilliant to use in schools to encourage children to look at everyday objects in a totally different way, challenging their creativity and seeing where their imaginations can take them. From creating their own food art collages to writing about their own journeys this book is a beautiful and valuable resource for any classroom or school library. If you are looking for something to keep the children amused over the school holidays Phaidon have produced a fantastic activity pack to keep them busy. Filled with lots of ideas to encourage creativity and spark their imaginations, its a perfect holiday treat. 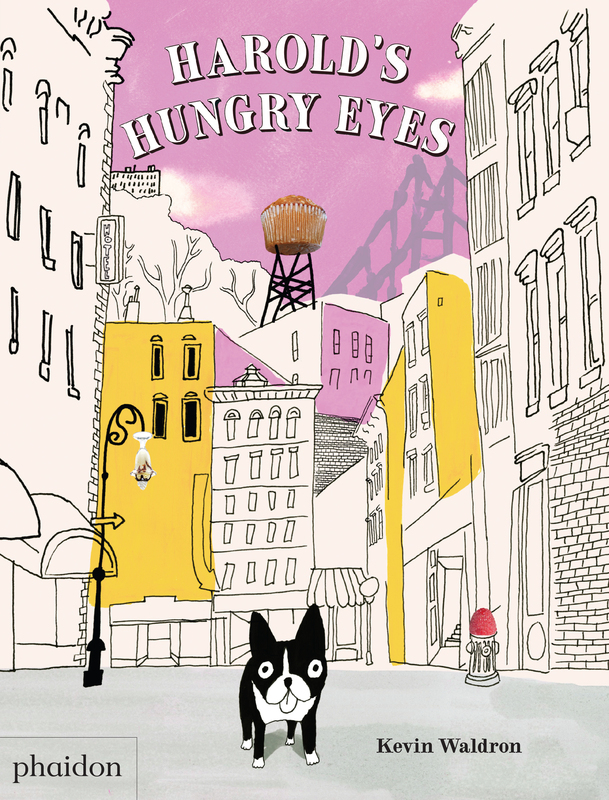 If you want to find out more about ‘Harold’s Hungry Eyes’ and take in look in the author Kevin Waldron’s sketch book you can catch up with last week’s PB Natter over on Storify. You can win a copy of this fantastic book over on my Twitter page just follow me and retweet to be in with a chance of winning. This entry was posted in Uncategorized on May 23, 2016 by bookloverjo. ‘Sweet Pizza’ is a heart warming tale from G.R. Gemin which will fill you with joy and leave you as satisfied as if you had eaten the finest Italian meal. It does however come with a warning whatever you do don’t read it on an empty stomach. 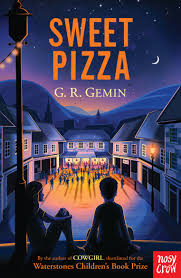 It tells the story of Joe a Welsh-Italian boy – although he insists he is Italian -Welsh- whose family runs a tatty café which is well past it’s sell by date. Whilst his Mum wants to escape from the burden of the family business Joe is desperate to preserve his family heritage and bring the café back to life. He vows to give the café one last chance and embarks on a series of entrepreneurial ideas to return it to it’s former glory at the heart of his community in Bryn Mawr. This book is thoroughly uplifting, food for the soul, which left me with a warm glow inside. G.R. Gemin’s rich characterisation produces the most wonderful characters who have these real hidden layers which are slowly unpeeled as the story develops. Through a series of taped recollections from Joe’s Nonno (grandfather) Beppe, we are given a fascinating insight into the lives of Italian immigrants in Wales and their experiences before and during the war. It examines the realities for them and draws a parallel with the attitudes of communities towards a new wave of immigrants in the present time. By referencing real life events it makes the story more compelling and you find yourself wrapped up as the dramatic past of Beppe’s life unfolds throughout the book. I was genuinely shocked by the true life events having never discovered this hidden part of our history, which isn’t commonly known today. Joe’s passion for his Italian heritage is delightful and the vivid descriptions of food and cooking tantalise all your senses, you can smell the garlic and onions frying and taste the rich, fiery puttanesca. He tries desperately to hold on to his roots wishing he was Joe Morelli instead of Joe Davis. His love for all things Italian leads to his obsession for opera, which provides a brilliant accompaniment as the sound surrounds you, providing the perfect backdrop as you get lost in the story. He captures all the dynamics of all the different communities within Bryn Mawr and highlights the struggle people have to settle into new areas and fitting in without compromising their identities. At the heart of the story we see that people’s humanity and compassion in difficult circumstances is the truly unifying factor that makes us all essentially the same regardless of background or heritage, It is a truly beautiful story or as Joe would describe it as ‘bravissimo’ and ‘buonissimo.’ You will definitely be ‘contentissimo’ after reading this fantastic book. ‘Sweet Pizza’ is due for release on the 2nd June. 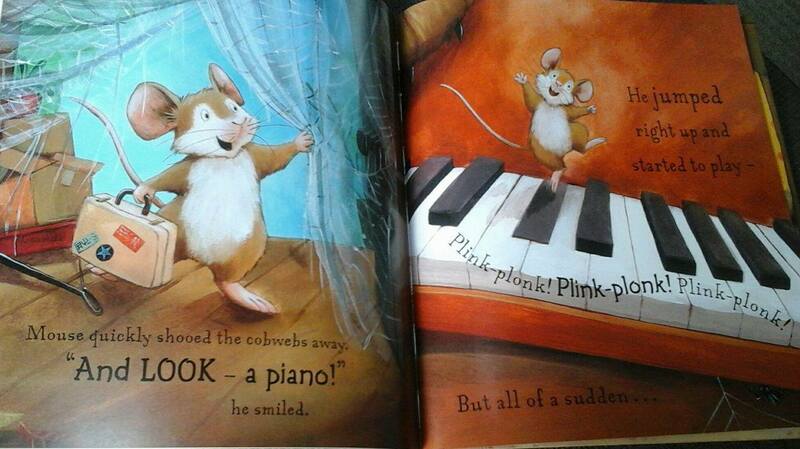 A big thank you to Fiona Scoble and Nosy Crow for sending me a copy of this book. This entry was posted in Uncategorized on May 18, 2016 by bookloverjo. 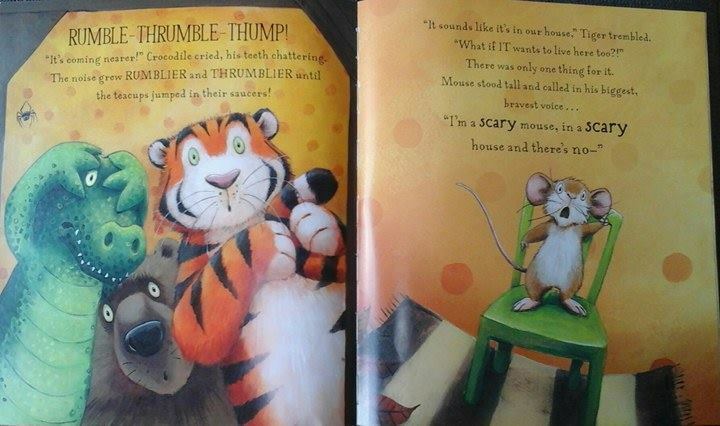 ‘The OMG Blog’ by Karen Mc Combie is a delightful book which explores friendship and families and provides a perfect transition read for children looking for the next step. It is definitely more tween than teen in the very best of ways. 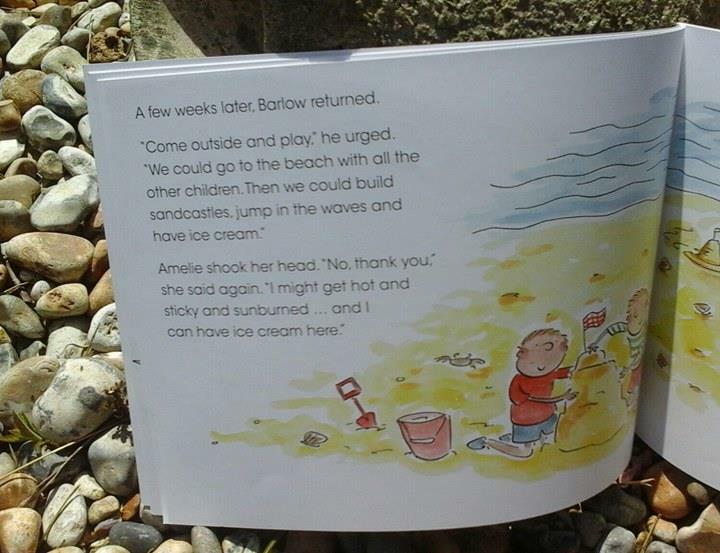 Full of warmth and humour it tackles the realities of family life and friendship. Everything about this book is massively appealing from the truly stunning cover to the variety of diverse characters. 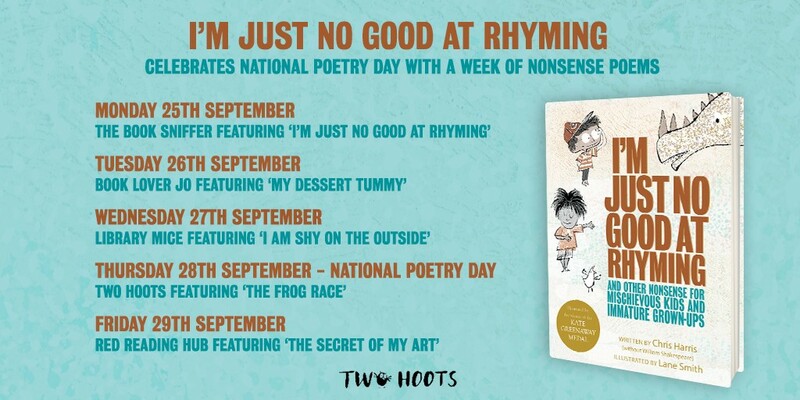 It is fun and really on trend and I’m sure it will be very popular in my school library. When Jessie, Shanice, Rose and Zarah find themselves in detention, they seem to have nothing in common in fact they couldn’t be anymore different if they tried. 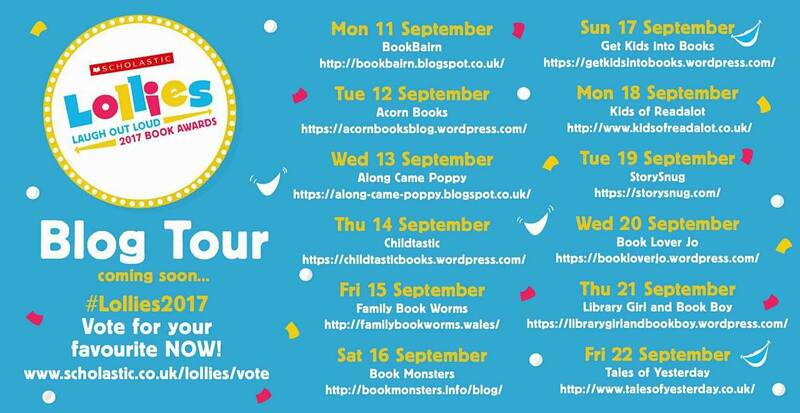 But when they’re challenged to take part in a blogging competition it seems they do have one big thing in common – crazy mums! ‘The (O)ur (M)ums – (G)rrr’ blog is born out of their frustrations and annoyance of being embarrassed on a daily basis. But as the blog’s popularity increases will they be able to hide behind their online identity or will their mums find them out? 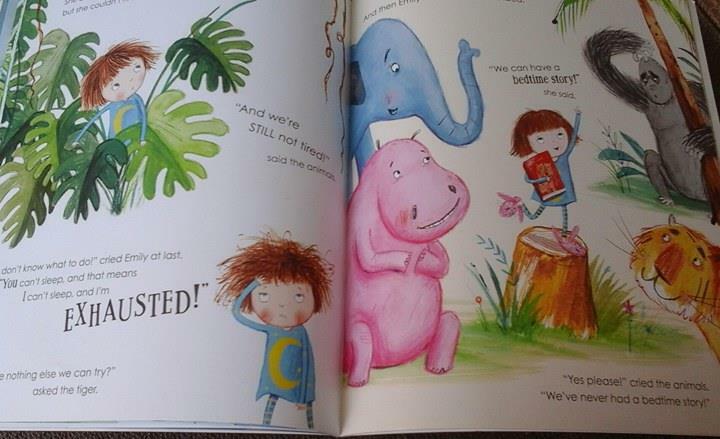 This book made me laugh out loud as I cringed at the Mums’ behaviours recognising myself in a lot of the characters. I’ve been the PTA Mum who is always around so that your children can never escape from you. I’ve dressed up as Alice in Wonderland at the age of 39 in the my children’s school ( I do work there so I’m not totally crazy). And when I asked my daughter which of the Mums I was most like she said “All of them!! !” I was a little bit shocked although she probably is very accurate. But I do feel it is my prerogative as a Mum to embarrass my children, although it’s often not on purpose just when I’m failing miserably to be on trend. I love that the story looks at the girl’s relationships with their families, it is more than just laughing at crazy mums. It has a real warmth and at the heart of it recognises the importance of family and friendships. This book will definitely appeal to fans of the blogging sensation Zoella, who seems to be incredibly popular with our year 6 girls. We all know that children are very social media savvy these days. 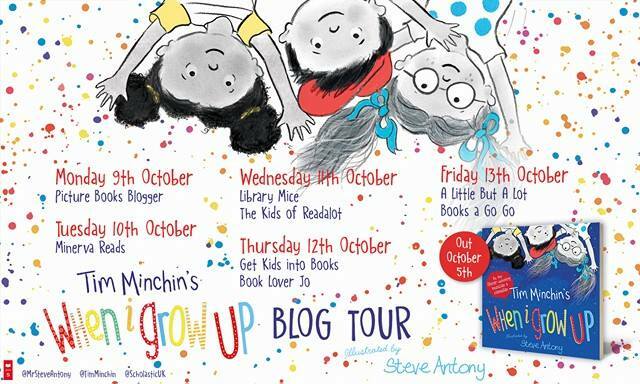 They are really aware of Blogging, Vlogging, Instagram and Snapchat and this takes a light hearted look at the problems they can cause for children. At the back of the book is a really useful guide to having fun and staying safe online, which I found very reassuring as a parent. 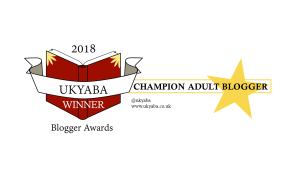 If you’ve enjoyed this review and want to find out more you can get a sneak peek of ‘The OMG Blog’ and read the first chapter here. 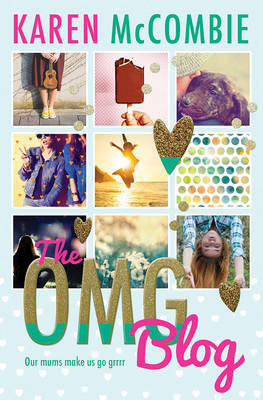 ‘The OMG Blog’ is a new imprint from Barrington Stoke designed to make middle grade books (8 – 12 years) accessible to all children, you can find out more here. Thank you to Barrington Stoke for sending me a copy of this book to review. This entry was posted in Uncategorized on May 15, 2016 by bookloverjo. 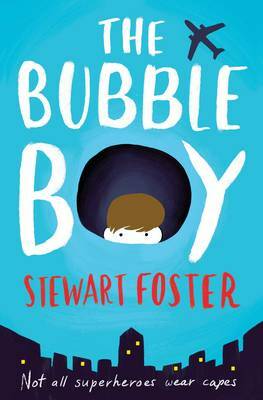 ‘The Bubble Boy’ by Stewart Foster is an incredible story which will take you on an emotional journey filled with sadness, hope and joy. Meet Joe, like many 11 year old boys he is football and superhero obsessed but this is were the similarity ends. Joe can’t remember a life outside of his hospital room. His medical condition means that life beyond his own ‘bubble is potentially fatal and the thought of ever leaving seems an impossible dream. ‘Bubble Boy’ by day, ‘Superhero’ by night – only in his dreams can Joe fulfil his ambition and overcome his frustrations. There is a marked contrast to his every day life of routine and caution versus the danger he faces in his dreams, saving the world from numerous disasters. But one day someone enters Joe’s life and the balance of normality is shifted and suddenly his world changes in a totally unexpected way. Prepare to meet an amazing cast of characters as we watch in intricate detail Joe’s every day life where people encompass him in this bubble in a desperate attempt to protect him from the outside world. You find yourself deeply empathising with his sister Beth who is struggling to balance her own life whilst ensuring Joe is not left alone. Their bond is heart wrenching as they both try to put the other first ahead of their own needs and desires, both desperately trying to protect the other. Henry – his only real friend another ‘Bubble Boy’ who lives in America – offers Joe a glimpse of a different future as NASA scientists develop pioneering technology to allow him the chance to go outside. Henry represents hope and empathy and their relationship and dependence on each other is incredibly poignant. But for me it’s the nurses who support Joe, Greg and Amir who make a real difference to his life. ‘Not all superheroes wear capes’, they each provide an invaluable life line to Joe. Whilst Greg provides a constant for Joe to rely on, it is Amir with his eccentric theories and crazy schemes which bring a new light into his life. I found myself totally engrossed with this beautiful, uplifting story it made me laugh, cry and I was utterly compelled to keep reading, hanging on to the belief that there has to be a happy ending for Joe. Never before have I experienced such an emotional attachment to a character, I was literally cheering him on and had a real physical reaction to each of his highs and lows. This is one of the books where I really struggle to do it justice and put into words how much I have enjoyed it. For every sentence you read in this review there are four more sentences which didn’t make the cut as they didn’t capture the effect this book had on me. Stewart Foster has created a character who will steal your heart and possess your thoughts, you will get completely lost in this fantastic tale. Thank you to Simon & Schuster for sending me a copy of this book to review. 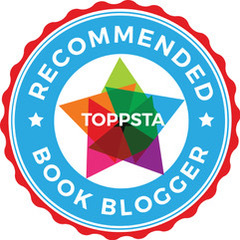 This entry was posted in Uncategorized on May 12, 2016 by bookloverjo. 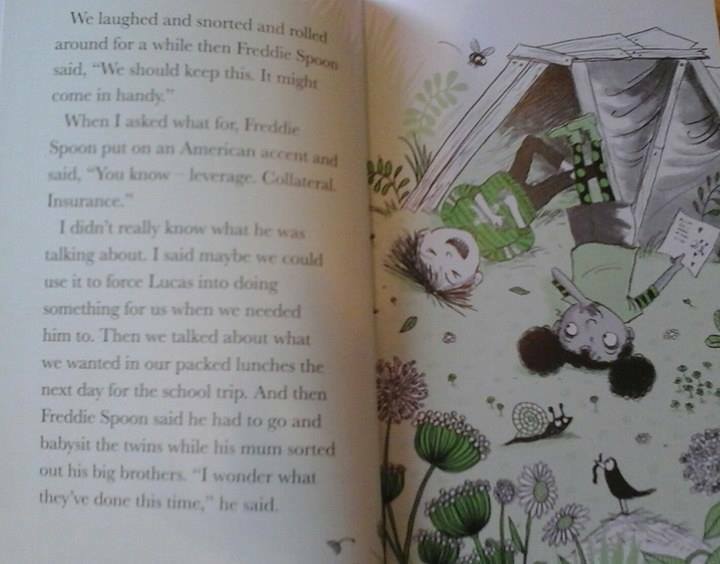 Nell and Freddie go on a school trip to a farm, where they get to do loads of cool stuff like feeding the animals and they even get to take an animal home with them as a special treat. Wait a minute!!! REWIND this doesn’t sound right surely the most exciting thing you come home with after a school trip is a pencil which if you’re lucky has a novelty rubber on the end, not an actual real life animal. But it is! 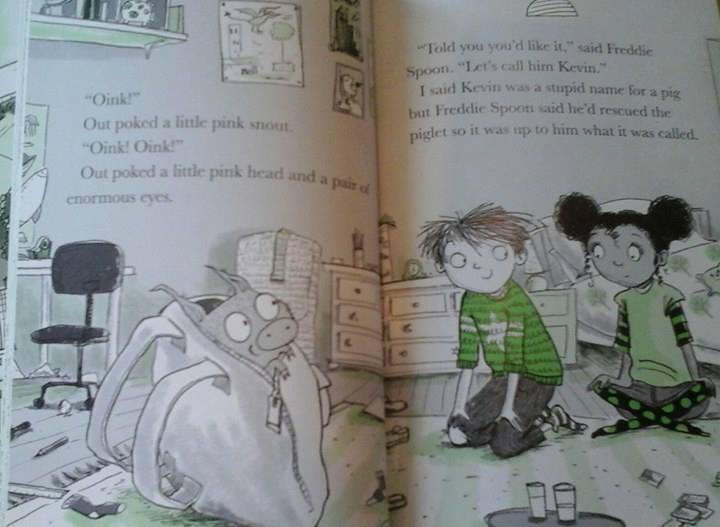 Freddie smuggles a piglet out in his backpack which Nell then decides to keep in her bedroom convinced she saving it from a future destined to end badly as part of a cooked breakfast. 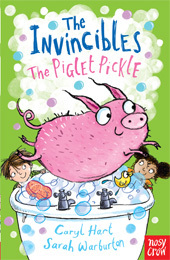 But when Nell’s big brother Lucas finds out they decide to do the right thing and return the piglet, what could possibly go wrong? 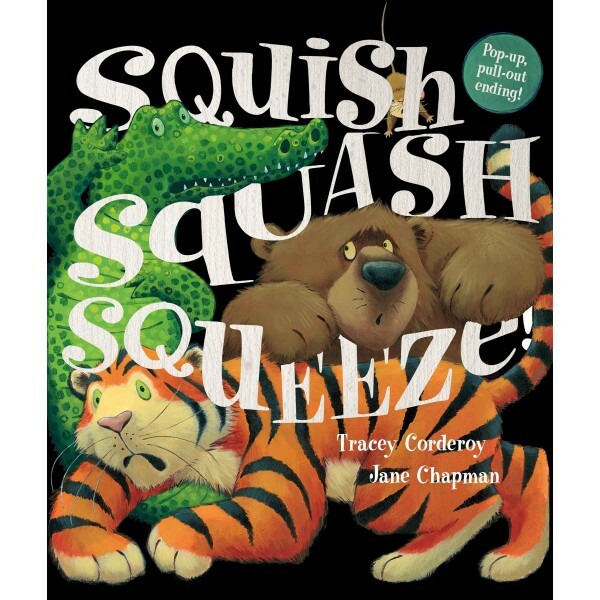 Caryl has created a truly engaging story which will delight newly confident readers, it made me laugh and smile in equal measures. The contrast between the really subtle humour and the properly laugh out loud moment is really enjoyable. 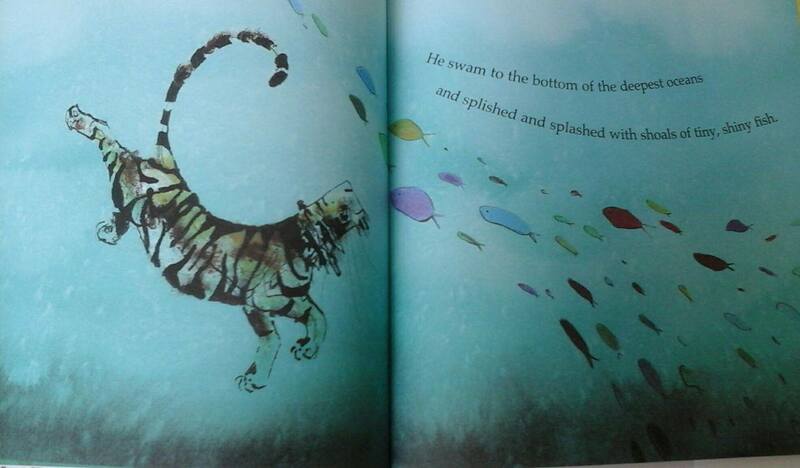 There is so much to discover within the story that it is perfect to read over and over again. 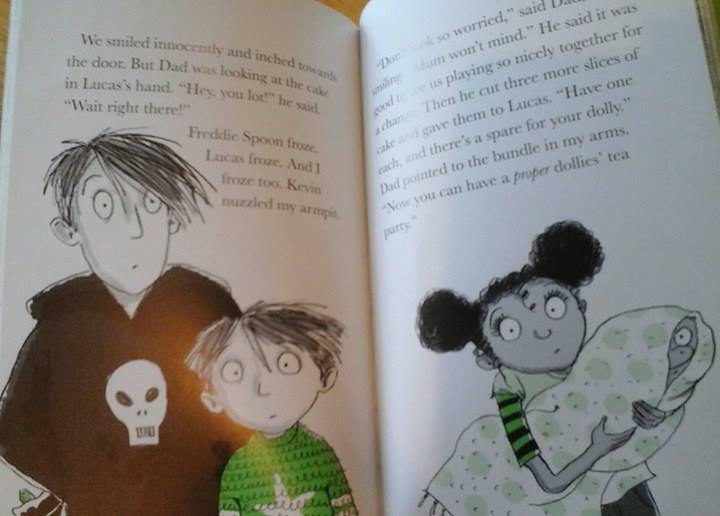 Sarah’s illustrations are gorgeous and incredibly witty capturing the chaos and charm of Nell’s family. I love this illustration where they are trying to look totally innocent when they have ‘up to no good’ clearly radiating from their faces. 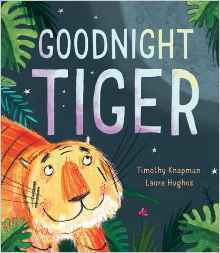 We’re are huge fans of illustrated fiction in my house and we all agree that this is a real treat such a fantastic new series. 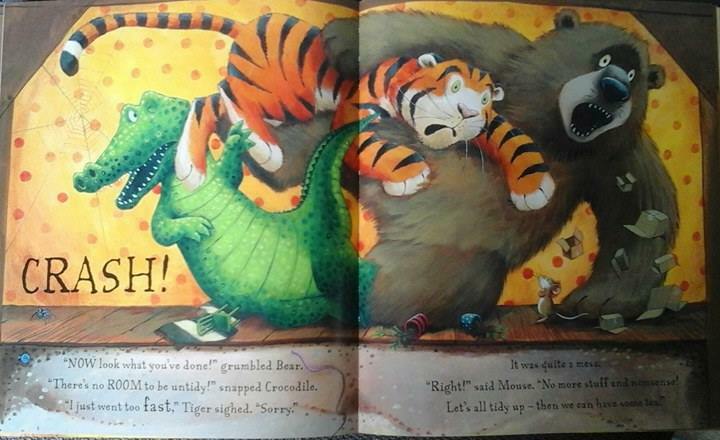 A truly brilliant collaboration I can’t recommend it enough, I know it will be a huge hit in my school library. 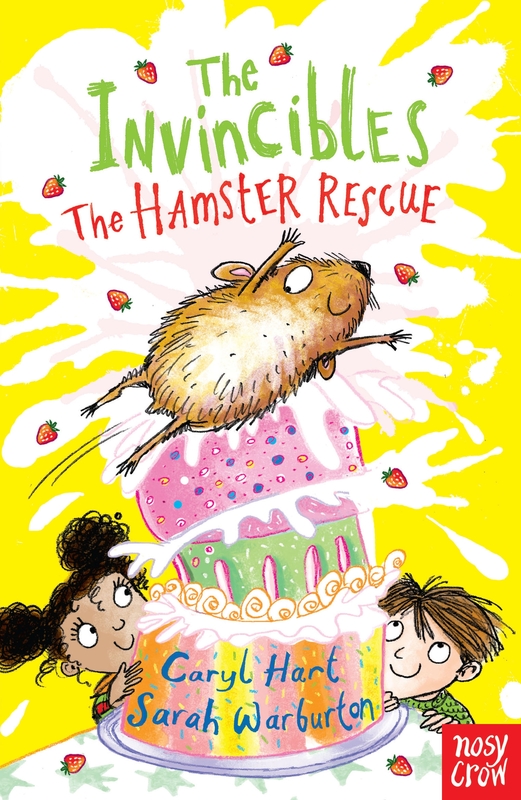 I’m pleased to say there is more to come from ‘The Invincibles’ later this year in their next adventure ‘The Hamster Rescue’ we can’t wait to find out what mischief they get up to next. This entry was posted in Uncategorized on May 8, 2016 by bookloverjo. After spending the weekend watching my children and their friends having the most amazing time outdoors clambering up sand dunes and exploring forests filled with wild garlic, I wished there was more that I could do to encourage them to spend more time outside. In a world filled with so many factors competing for your child’s attention inside, this is always a challenge. 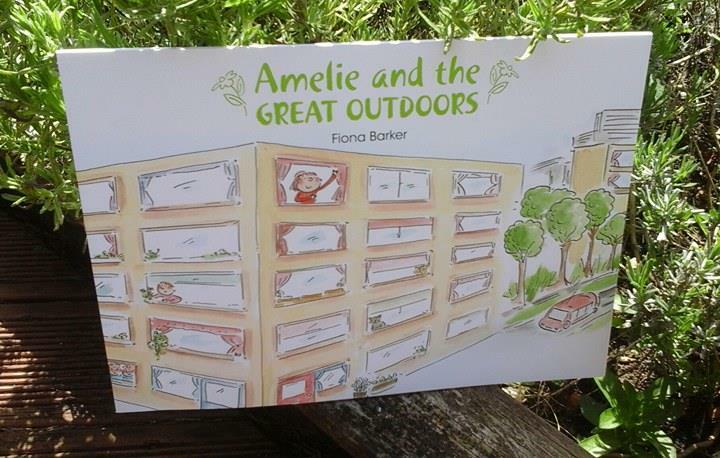 Fiona Barker has written a lovely book called ‘Amelie and the Great Outdoors’ beautifully illustrated by Rosie Brooks which celebrates the joys of spending time outside. 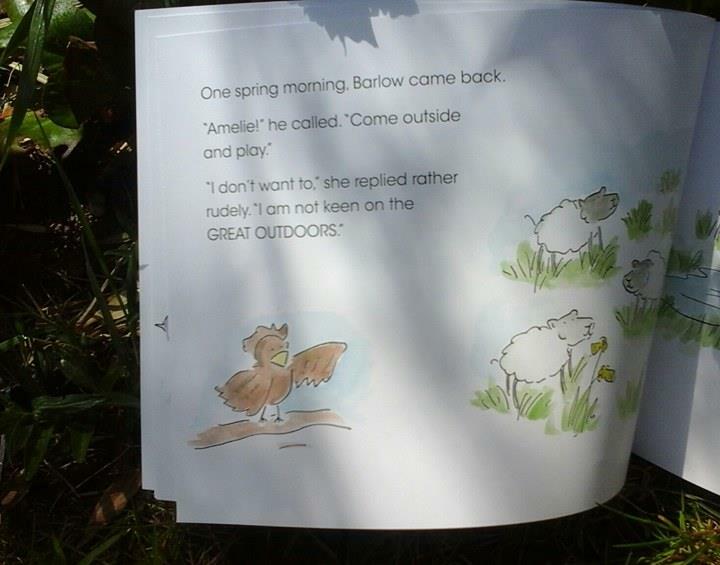 Amelie the little girl in the story has never been outside her flat preferring to stay inside because the ‘great outdoors had no computer games, no toys and….worst of all….no telly!’ Despite her parent’s best intentions nothing they can do can convince her to leave the house until one day she stumbles across a little bird called Barlow who flies on to her windowsill. Barlow visits her through each of the seasons enticing her with offers of all the fun and excitement that is waiting for her if only she would leave the house. 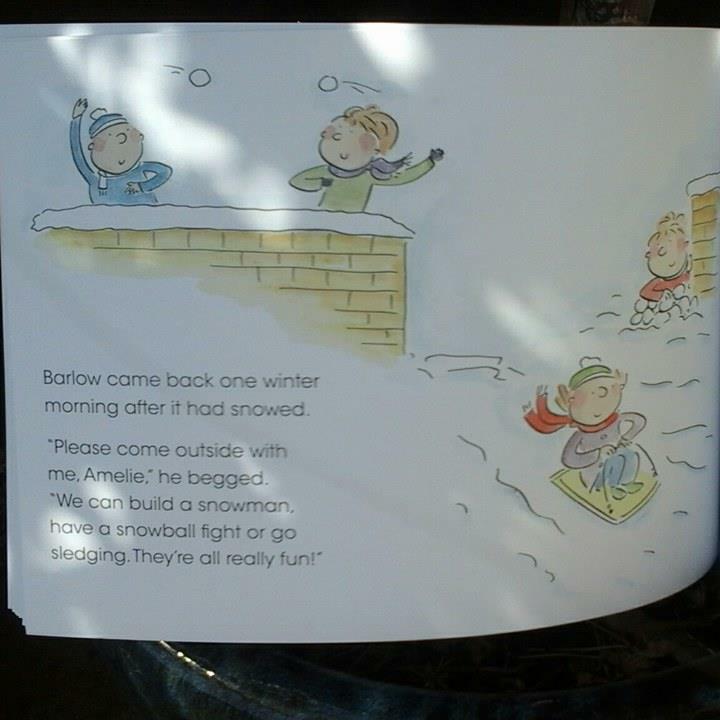 But his suggestions of jumping over puddles, building sandcastles, leaf kicking or sledging fail to tempt Amelie and one day Barlow no longer returns. Worried about her new friend she has to decide if she can venture up the courage to go outside and find him. 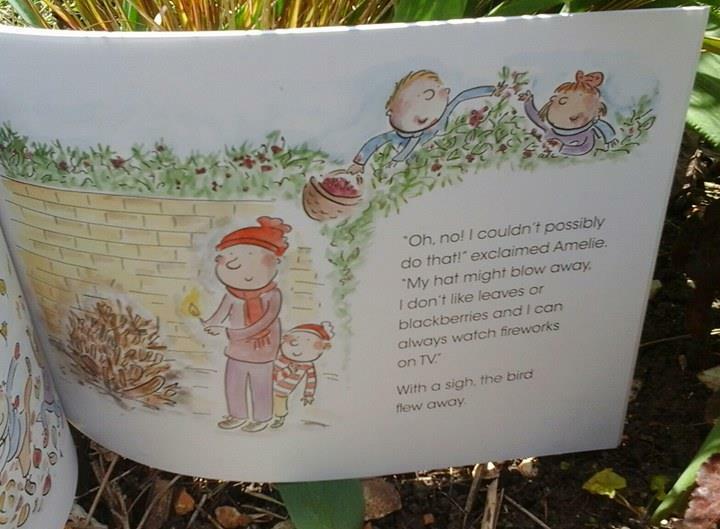 When Amelie eventually overcomes her fear she soon realises that she has been missing out on all of these wonderful activities. 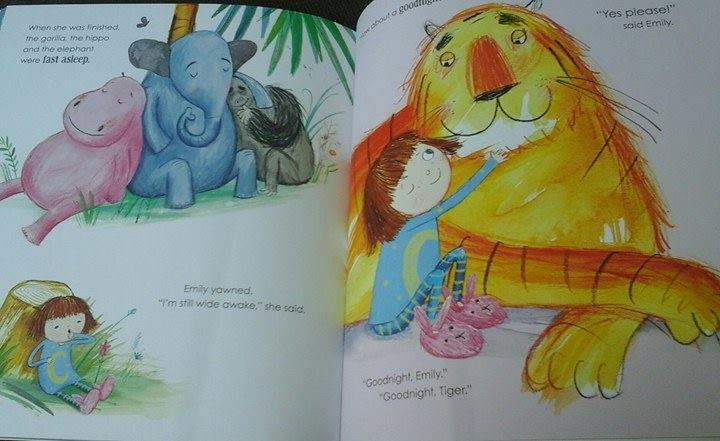 This story is a gentle tale which would be perfect for sharing with younger children who are feeling anxious about change or trying new experiences. Fiona wrote this to help her daughter who hated touching grass to begin enjoying playing outside. It provides the opportunity for parents and teachers to talk to their children about how easy it is to become involved in gadgets inside so that they forget about the interesting, exciting world awaiting them. Rosie Brook’s enchanting illustrations take us on a journey through the seasons capturing all the fun and excitement of the children playing and having fun. 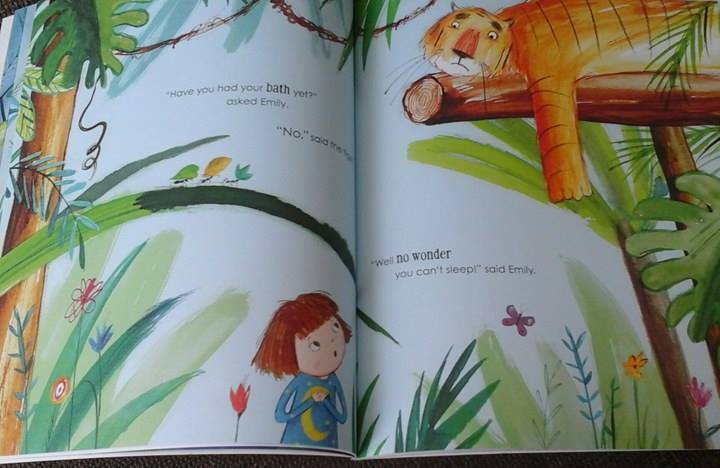 They are delightful and perfectly complement Fiona’s engaging and thoughtful writing. Thank you to Fiona Barker for sending me a copy of this book to review, now I’m heading outside to enjoy reading a book in the sun. This entry was posted in Uncategorized on May 4, 2016 by bookloverjo.